Chronicwriter's head is a circus that operate 24/7. His brain is full of unanswered questions. Little kids have lot of questions too. When their questions are not answered properly they become mentally unstable. The unstable nature of Chronicwriter is explained in this post. Most of the time, he does unimaginable, immature things that would make anyone hate him. But many such immature acts of Chronicwriter has indeed saved the honour and pride of his friend Meena. Many girls have walked in Chronicwriter's life. But his first love,"Renu" is still his evergreen love. However the girl,"Meena" occupied Chronicwriter's heart for two years. 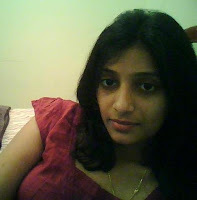 Meena was Chronicwriter's MBA batch mate. She was/is a beautiful babe indeed. Let us hear the story from his mouth. When I first saw her, I could hear Latin music in my ears. The first day in college, I realised that 32 out of the total 73 guys in college had fallen in love with her. I was one among them. This is when I decided to be a cut above the rest.That same evening,I destroyed the hope of 30 of the 32 guys by saying," Hey guys! I am going out with Meena". They had to believe me because I spoke in an authoritative tone. Only two guys did not buy my statement. One was me and the other guy was a brainy guy. His name was Jomal Koshy. The very next day, Jomal tried to hit on Meena. Before I could ask her to have lunch with me, Jomal jumped and asked her to have lunch with him. She readily accepted. I followed them to the canteen and sat in the adjacent table. Jomal realised that Me, being there would be a great hindrance for him and hence he tried to talk in a low, calm voice. After sometime I could see that Meena was getting irritated. She suddenly got up from the seat and rushed out of the canteen. I could hear her mumbling " Why do people with bad breath always want to tell you secrets?" as she made her way out of the canteen. I was happy now. My only competitor was now out of contention. The first week in college was over and by now the ice was broken. We started forming our own gang of friends. Meena and I were in the same group. We used to hang out together as a group. We started having food in the canteen. This picture was taken when we had food in the canteen. I am the one in the white Kurta. You can see me holding a plate full of Indian food. Meena is the girl in Blue T-shirt. After one month in College, Meena and I had already become great friends. She would share her lunch with me. Our eyes would talk the language of silence. I knew that she was in love with me. I also knew that she was waiting for me to propose her. From my great experience with my relationship with girls, i had become an expert in knowing what a girl wants. All my previous assumptions had backfired. But I knew that this time,I was right when I realised that Meena was in love with me. She: Chriz! I am stuck here. She: I am stuck outside the elevator. I am waiting for the last 15 minutes. She: Chriz.. I do not know what to do now. Please help me. Me: Ok Ponds.. Why don't you use the stair case? She: Thank you Chriz. I would do that. Me: Congrats Ponds. Now tell me, What did you achieve? She: I successfully completed a very complicated Jigsaw puzzle. Me: How much time did you take to complete the puzzle? She: I just took two days to complete it. Me: But don't you think that it is a very long time to complete a puzzle? She: No. It is not. In fact the cover says "2 years and above"
Me: Have you at least finished 50% of the puzzle? Me: Does the cover of the puzzle have the image of the puzzle? She: Yes! The Puzzle is about a Rooster. Me: What else do you see in the cover? Me: What does that say? Me: What? How do the puzzle pieces look like? She: They are brown in color and they are not flat. Me: Ok! Ponds. I have a head ache now. Can you bring the box to college tomorrow? The next day she brought the corn flakes box[link] to college. I took it to the boys hostel. We guys had a great breakfast the next morning. Two years of college life went by like a passing cloud. I never proposed to her;neither did she. Soon the graduation day came. We were all in black attire. I am the one standing second from left and Meena is the one standing second from right. College life ended and we all moved to different parts of the world. We chose our own future. Me: But why Ponds now? What made you think about me? Me: The one in which we all are in black attire? She: I knew that you were a chicken. That's why I wanted to give you one last chance on our graduation day. Me: But I don't remember you giving me any hints on the graduation day. Me: Can I mend it now? Can I make you mine now? She: No. It is too late. I have a guy now. Awwww....the ending was sad. But i had a good laugh reading the post. Ur statement 'Meena was the blonde of your life' was funny. Funny. But I don't think I wld beve any of your tales. How?? I mean how on earth can you cook up such stories!!! LOL!! how could u possibly write such a long post with absolutely no concrete ideas to write on!! Seriously I am stunned!! Man you are clever :) I mean it... but you are a dumbo when it comes to women... Why the hell you missed out on such a good looking girl.. if it continues this way, I warn you you will be a Chronic bachelor..
Oh..! Sad endings.. why don't you hunt down the guy with Meena and giv him a hug to thank him! Chriz..this is completely different from ur regular one....excellent naration,n yup,i liked the way u ended the post!!!! Thoroughly enjoyed it, but the end was pretty emo. Loved the Kellogs Jigsam puzzle part..Never thought of cornflakes in tat manner! You've got some imagination!! P.S: Did Meena or whoever it is in tat picture,read this?? r dose convos real...I think not!!! Prason whr do u come up wid such stories yaar..
oohhhhhhhh...sad love story, u were not lucky enough to get a brilliant gem like meena ..u fool! But it was FUNNY!. I was actually sitting here and laughing in the middle of the night. And.. she surely deserves a round of applause because she could complete a jigsaw puzzle which said 2 YEARS and above in just 2 DAYS! :P :P Very awesome. I'm your fan. :) True one. your sarastic comments are one of its types. Too good. Keep up! BTW, What is with Vick vaporub, ponds & Kellogs, new of way of promoting brand? u made me laugh all through the post! the intellectual talk were gud..
dude she is beautiful,, i m already in love with her..
why would u call her ponds? hahahaha ... yea ... she's the blonde in MY life too :D ... althought ur lucky ... coz i have her for life :D !!! ROFL...that elevator joke was v funny!! jigsaw was good too! keep writing..cheers! Lol......Good thing u didnt propose.........u dont want a dumb wifey do u? hahahahahahahahaha...you are a chicken Chriz!!! Awww...sad end. But I don't believe any of it. You are so good at cooking up stories!! cool story..""But you were holding Rohini's hand"" tats really coolest sad thing to do before ur blond of ur life..
very cute post, chriz!! gotta hand it to ya! all those intelligent conversations rock! But loved the cornflakes bit! If I were meena you'd be getting a nice thrashing now da! LOVE YOUR NEW LOOK. Blog looks amazing!!! When the elevator gets out of order, the easiest way is to jump down- forgot this golden rule? Very well written chris, sweet story but ending was quite sad..
Yeah my brother from another mother something similar has happened with me as well so I can relate & imagine little bit of this! Thanks for sharing your Sentimental Journey !! Hahahaha, Yes I smiled dude. I appreciate this friend of yours who has given you the permission to use her as a character. Hats off to your friendship!! Eh! Good at cooking up stories ah! I thought i was bad in understanding subtle gesture, but you are one more gem in the same series. Amazing narration ! I'm disappointed with the way how it ended. If Pond's had real love over you , she could have approached you by many means.If you guys were shy to express love , face-face , I wonder why you guys never used the Short Messaging Service to express the hearts and share the feelings over one another. ? wot a gr8 post... Amazng... Luv d post..